Advice on how to get the best results from concrete blocks, bricks, paving, garden edging and retaining wall systems from Cowra Concrete Products. Cowra Concrete Products should be dry when laid to minimise subsequent shrinkage. Keep mortar off the face of the blocks. Clean off droppings as work progresses and before mortar sets. Avoid cleaning down with acid whenever possible. 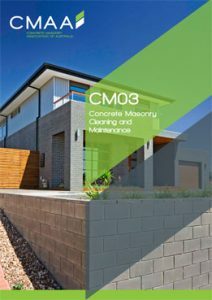 Click here for the Concrete Masonry Association of Australia publication, Concrete Masonry Cleaning and Masonry, or pick up a copy from Cowra Concrete Products. Colour – order enough product! Take care to order sufficient product to complete the project all at once, to avoid the possibility of batch variations. Cowra Concrete Products respond differently to moisture movement and temperature change than clay bricks. Assuming sound foundations are provided, cracks in walls can be avoided with the correct use of control joints, bond beams and/or joint reinforcement. Rules for the use of these elements are contained in Australian Standard 3700-2001. M4 1 0 + .25 3 High durability – use when in contact with earth, in retaining walls, below DPC’2, in fences adjacent to the sea, in capping courses to fences and parapets. M4 1 1+ .5 water thickener 4.5 4 Structural brickwork and severe exposure – fences – external walls adjacent to seafront. M4 1 1+ 1 water thickener 6.5 General purpose with moderate exposure. The water thickener referred to in this table is methyl cellulose.